The United Nations (UN) is an organization between countries established on 24 October 1945 to promote international cooperation. 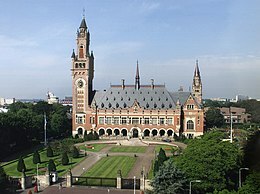 It was founded to replace the League of Nations following World War II and to prevent another conflict. When it was founded, the UN had 51 Member States; there are now 193. 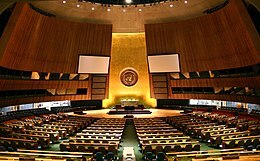 Most nations are members of the UN and send diplomats to the headquarters to hold meetings and make decisions about global issues. After World War I, the nations of the world formed the League of Nations. This organization was a place where nations could talk through their differences calmly. However, some countries like Germany, Italy and Japan ignored the League and tried to solve their problems through war. Members of the League of Nations did not want to go to war to protect other members and the League failed. A Second World War soon followed. The Allies of World War II often called themselves "the United Nations" (united against the Axis Powers). After the War, the winners formed a new organization for world peace. On 25th April 1945 in San Francisco, they decided on the name '"United Nations". In June they signed the United Nations Charter saying how the organization would work. The UN was created on 24 October 1945 and its first meeting was held in January 1946. Since 1947 the 24th of October has been called “United Nations Day”. 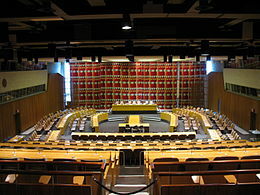 The main building for the United Nations is in New York City in the United States of America, but the UN also has important offices in Geneva (Switzerland), Nairobi (Kenya) and Vienna (Austria). The UN tries to be peaceful, but sometimes when talks do not work the UN, unlike the League of Nations, will fight too. In the 1950s the UN helped South Korea in a war against North Korea, and in the 1990s the UN helped to force Iraqi soldiers out of Kuwait. At other times, the UN has formed 'peacekeeping' forces. UN peacekeepers travel to troubled places in the world and try - sometimes successfully, sometimes not - to keep the peace. Today there are UN peacekeepers working in Afghanistan, Cyprus, Haiti, Liberia and several other countries. Through a series of goals, resolutions and declarations adopted by member nations of the United Nations, the world has a set of commitments, actions and goals to stop and reverse the spread of HIV and scale up towards universal access to HIV prevention, treatment, care and support services. decides on the admission of new members, on proposal of the U.N.S.C. elects the non-permanent members of the U.N.S.C., all members of Economic and Social Council, on the proposal of the U.N.S.C. the U.N. Secretary General, and the 15 judges of the I.C.J. its chairman - the U.N. Secretary General - is elected by the U.N. General Assembly for a five-year mandate and is the most important representative of the U.N.
↑ Official Languages, United Nations. Retrieved 22 May 2015. This page was last changed on 10 December 2018, at 17:47.